Journalists under fire vow to do their jobs. The report from the political frontlines is not particularly cheery — unless you’re a red-hatter. 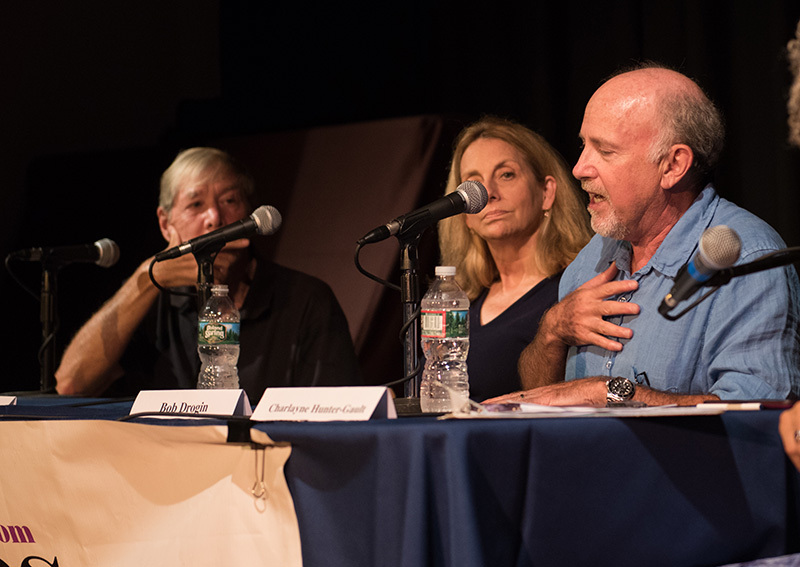 No voices from the right were heard in a standing-room-only crowd of Island residents and visitors at the Grange Hall on Sunday night who were attending “Politics and the Press: Covering the Chaos,” the kickoff panel for the fifth annual Islanders Write (IW) conference, which continued all day on Monday. Based on conversations before the event with audience members, the crowd was hoping to find rays of light in the political storm, but a trio of clear-eyed veteran journalists reported no end in sight from Trump-driven divisiveness casting a pall over the nation. Crutcher also previewed comments by attendees and speakers that opposite sides are consuming media that supports already held beliefs. “We don’t learn in an echo chamber,” he said. Paul Magid of West Tisbury, with his wife Anita Botti, was rooting for Sunday night fireworks. “I’m hoping these guys harass [President Trump],” he said. Summer resident Joel Feldman was hoping for insights. “I want to hear something about political power that we haven’t heard before,” he said. Anita Feldman was succinct: “I am frightened for journalism,” she said. Chilmark resident Doug West agreed. “This is serious stuff. I’m hoping for some ideas on what each of us can do,” he said. Bob Drogin (LA Times), Melinda Henneberger (Kansas City Star), and Ric Patterson (Boston Globe/Huffington Post columnist), are full-fledged “enemies of the people,” as President Trump describes mainstream media. They were selected with an eye to different perspectives. The panel was shrewdly moderated by longtime journalist Charlayne Hunter-Gault. Drogin, deputy Washington, D.C., bureau chief, has nearly 40 years working in the world’s hot spots. Drogin doesn’t scare easily. “It’s a cross between a five-alarm fire and a three-ring circus. We’ve never had this pace of events. Used to be two daily news cycles, now there are four to five a day, so keeping up is the biggest challenge. The biggest problem is that Trump is our assignment editor, whatever tweets [arrive]. Some are important, but take away from important things in this administration we can’t get to, “ he said. Henneberger is a boots-on-the-ground journalist in red-state America. Born and raised in the Midwest, Henneberger sees a radical amping-up of Trump supporters in the heartland against the media. “We’ve all seen video of Trump supporters turning on Jim Acosta [CNN White House reporter]. I still see one grandmotherly woman, her face contorted, giving Acosta the finger,” she said. She sees it also away from rallies, on the ground, in small towns in which she is known. “We could always have conversations. They’d tease you, but were willing to talk. I began talking to a guy recently, and he began screaming, calling, ‘Fake news!’ I honestly became concerned he was going to his truck and get a gun,” she said. An event which got her particular attention is occurring right now in Poplar Bluff (pop. 17,000), Mo., near the Tennessee and Kentucky borders. “The new steel tariffs are putting America’s largest nail factory, employing 500 people, in danger of going out of business. Layoffs have begun. People there say they are willing to vote against their own best interests and are honored to make the sacrifice in the best interest of the country. Now, people have not yet felt the pinch of mortgage payments and bills, so we’ll see what happens,” she said. Local press reports from Poplar Bluff over the past month have quoted officials as saying a complete shutdown could occur by Labor Day, and the company may relocate to Mexico if it doesn’t get a requested tariff exclusion soon from the federal government. In a lighter aside, Henneberger, working at New York Newsday during Trump’s first divorce, recalled the gossip columnist, her officemate, got phone calls from Trump updating her about famous, beautiful women who were chasing him. “I still remember one call and the columnist saying, ‘Donald, no. Madonna is not interested in you,’” Henneberger said. Author and attorney Richard North (Ric) Patterson worked on the Watergate investigation early in his law career. He sees the current Mueller probe as different from, and in a way more difficult than, the Watergate circumstances. “By comparison, Trump’s true inner circle is smaller, four people, including Don Jr., Jared, and Manafort. Politically, it’s different. Democrats controlled Congress during Watergate, and more moderate Republicans took a courageous stand. It’s hard to imagine that happening today. That suggests the situation is worse. I looked at this hard as a lawyer, and I think Trump and his campaign conspired with Russia. Conspiracy is harder to prove, and there is less help. The congressional committees are trying to bury it,” he said. The panelists agreed that a blue wave in the midterm elections would provide more balance to the process, that the Mueller probe is an open question, but they are watching some canaries in the mine. The FCC has not granted Sinclair Broadcasting its final license to operate dozens of local TV stations in a Trump-friendly manner. But mostly they were certain that they would, as Drogin advises his reporters, continue to do their jobs. Check out coverage of Monday’s panels here. The collective “relief” for the Trump haters must have been ecstatic. A favor, please. Consider closing comments for this. C’mon, Mr. New Englander, maybe the islanders would like to read a little about those three Globalists. Maybe we can get the real skinny out in the open – you know, Common Cause, Council on Foreign Relations…take it away! I bet you believe in lizard people too. I hate when people say “not my President” Whether you voted for him or not he is the President of our United States and we should all hope he succeeds. To hope that a President fails is un American and anti progressive thinking. What do you say Trump is president of when close to every day he attempts to delegitimize media that criticizes what he says and does? The media has mostly delegitimized itself. Yes, too many newspaper editorial staffs are pandering to this current administration and supporters’ attempt to make this a one-party government. But big GOP names say something dumb in public almost every day; even Fox Entertainment has started reporting real news. Except when the president is actively trying to destroy the very institutions and relationships that is the foundation of our society. I would say hoping he fails is the duty of every true patriot. They don’t just criticize. They lie, fabricate, obfuscate,imply by exaggeration. They hate him so much that they have lost any conscience they might have had. Okay, that was funny. Now if only Republicans would get the joke. I see “main stream” news report facts– Fox reports opinions. andrew— you have finally crossed over to the bright side.. your summary of the white house attitude towards Obama and Hillary is right on point.